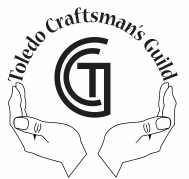 The Toledo Craftsman's Guild has promoted shows in the Toledo area for over 40 years. Our shows have been well established at most of the locations for the past 15 years. Our shows rotate around the most desirable times of the year (mid-spring, mid-fall, Thanksgiving, and Christmas holidays). Our show fees are very reasonable compared to promoter show fees. Since we are a non-profit organization, we do not charge admission or parking to our shows which encourages the public to attend. We use many forms media for advertising, including most local papers, radio, flyers, postcards, and more. All our members are juried in their art/craft so only quality artists and crafters are represented. We have four (4) regularly scheduled Guild member meetings per year and a quarterly newsletter for sharing and seeking member input and ideas. Our membership list can be shared with other organizations upon request so that you may be invited to other area shows. We believe that the quality artist and craft members of the Toledo Craftsman's Guild are what make our shows special in the Toledo area. Did we convince you to join? If so, click here to apply!